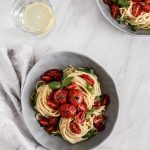 This Roasted Tomato Lemon Pesto Pasta is tossed in freshly squeezed lemon & pesto & then topped with oven roasted tomatoes for an array of delicious summer flavors. 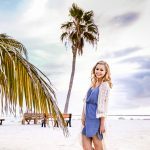 Today I’m sharing my last summer recipe for the season. I’d be sad, but I’m ending the summer season with one of my favorite go-to pasta recipes. Plus when summer ends, fall begins, & I can’t be sad about that! And I’ve got a little secret to share with you, I’ve already started baking for fall… And boy is it going to be a delicious baking season! But I’ll try not to get ahead of myself. I know it is still officially summer, & while I will be making this pasta recipe all fall & winter, I need to stay focused on summer. This may just be one of Roger & I’s favorite pasta recipes because it feels so light. 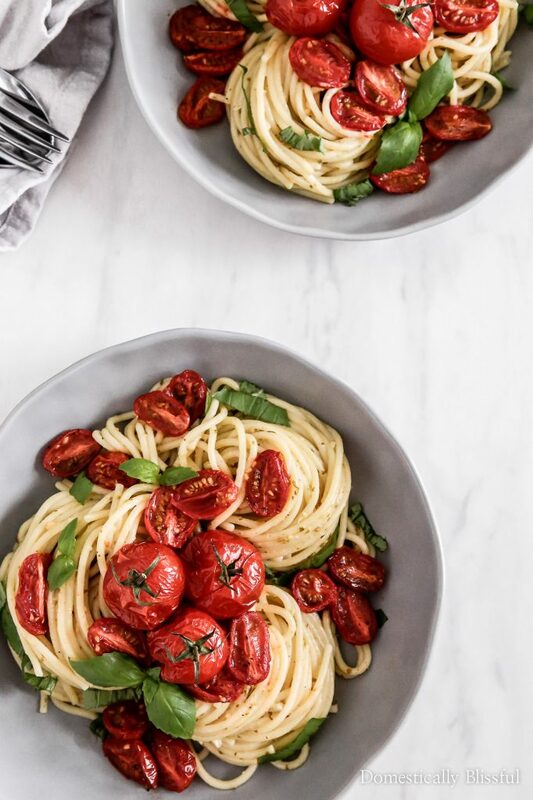 Well… as light as pasta can get. And let’s face it, I never just eat one serving. Who does?? 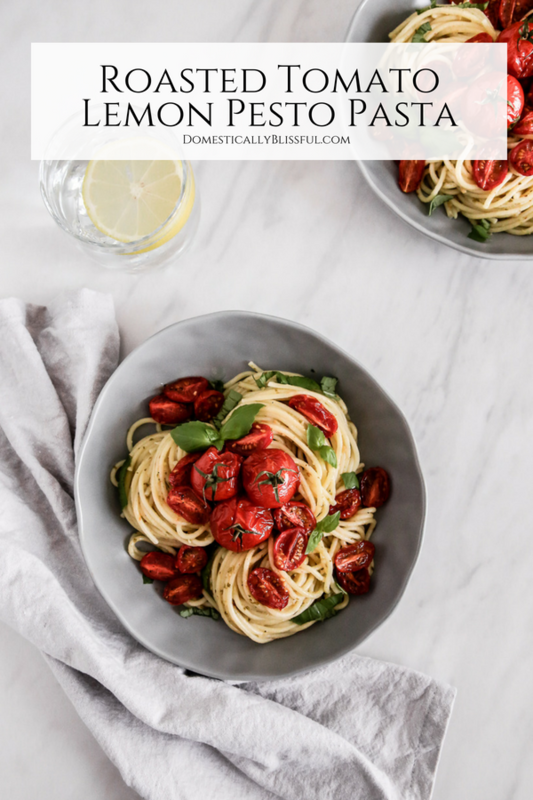 And I won’t tell if you go for seconds or even thirds of this Roasted Tomato Lemon Pesto Pasta, it’s that good! I probably shouldn’t admit, but as soon as I finished taking these pictures I ate two servings. And I’m not even a little bit ashamed!! Next, slice your cherry tomatoes in half & place them on the baking sheet with the inside of the tomatoes facing up. 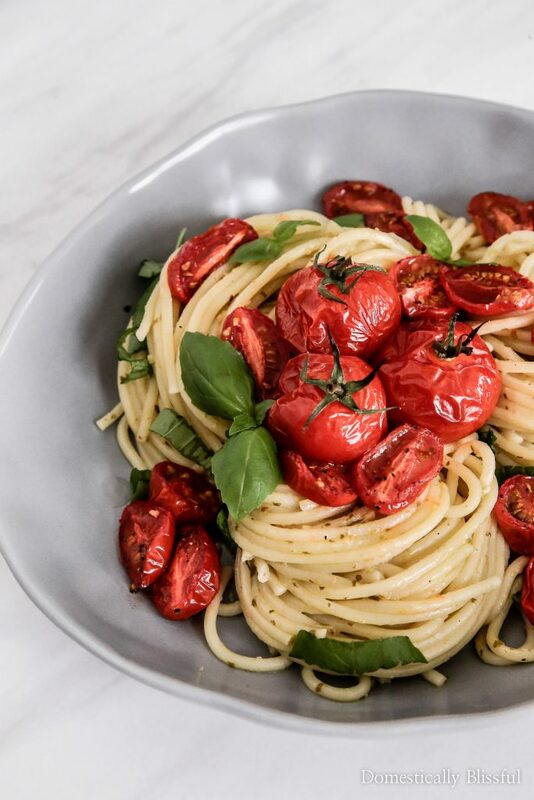 Drizzle the cherry tomatoes with 1 tablespoon extra virgin olive oil. Then sprinkle with 1 dash of salt, 1 dash of pepper, & 1/4 teaspoon sugar. 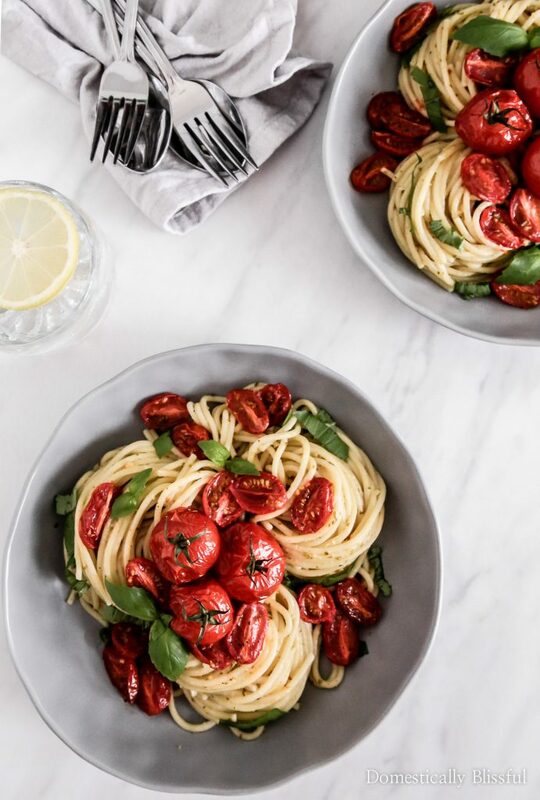 Place your 12 cocktail tomatoes on the baking sheet next to the sliced cherry tomatoes & bake for 15-18 minutes or until the cherry tomatoes are bubbly. While the tomatoes are roasting cook the spaghetti according to their packaging instructions. In a small bowl combine the lemon juice from 1 lemon & 3 heaping tablespoons pesto. Set to the side. Drain the pasta & return it to your pot, toss with the lemon pesto sauce adding salt & pepper to taste. 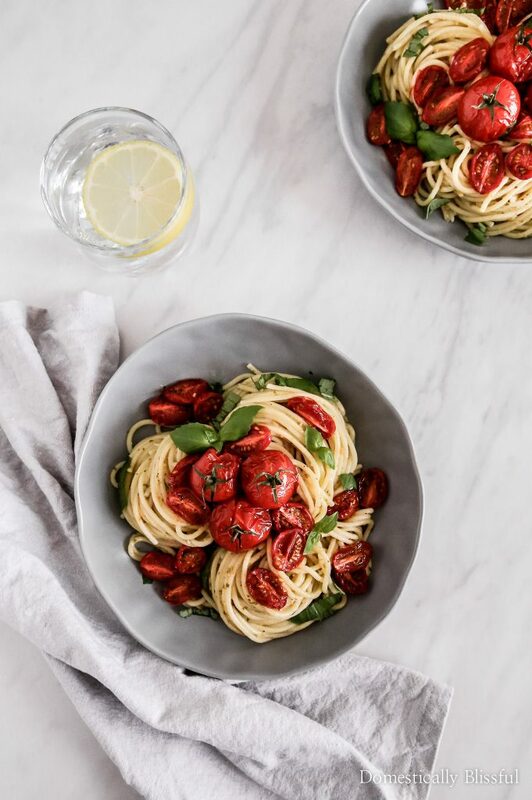 Serve topped with the roasted tomatoes & fresh sprigs of basil. What is your favorite warm summer pasta? This sounds delicious! I sometimes take some Italian dressing and use it instead of pesto when I’m busy (read as lazy). Add the roasted tomato and a little bit of cucumber and done! Hope you share a lot of those fall recipes! I hope you have been enjoying all of Domestically Blissful’s new fall recipes!